Kyabje Khenchen Pema Sherab Rinpoche is the senior-most Khenpo in the Nyingma lineage of Tibetan Buddhism, and among the most important lineage holders in the Palyul tradition. 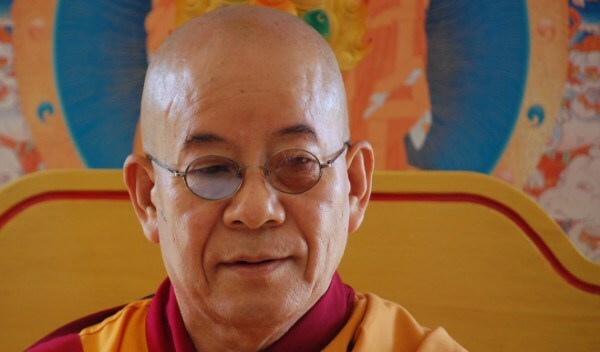 Khenchen Rinpoche is also the oldest and closest student of the late His Holiness Penor Rinpoche, and worked tirelessly with him from 1968 onwards, when Namdroling Monsastery was being established in Bylakuppe in south India. Today, he continues to uphold His Holiness Penor Rinpoche’s legacy. Khenchen Rinpoche is one of the last of a generation of authentic Lamas who hold the pure lineage of the Nyingma tradition, both Kama and Terma. We have all heard of the great masters in the past such as His Holiness Dudjom Rinpoche, His Holiness Dilgo Khyentse Rinpoche, His Holiness Penor Rinpoche and many more; the blessings and the transmission of Dzogpachenpo of these great masters is very much alive in Khenchen Rinpoche’s being, like a beacon shining through the darkness of our present time. On Saturday 15th September will be the Guru Rinpoche and Tara empowerments. On Sunday 16th September will be Medicine Buddha and Amitabha Buddha empowerments. 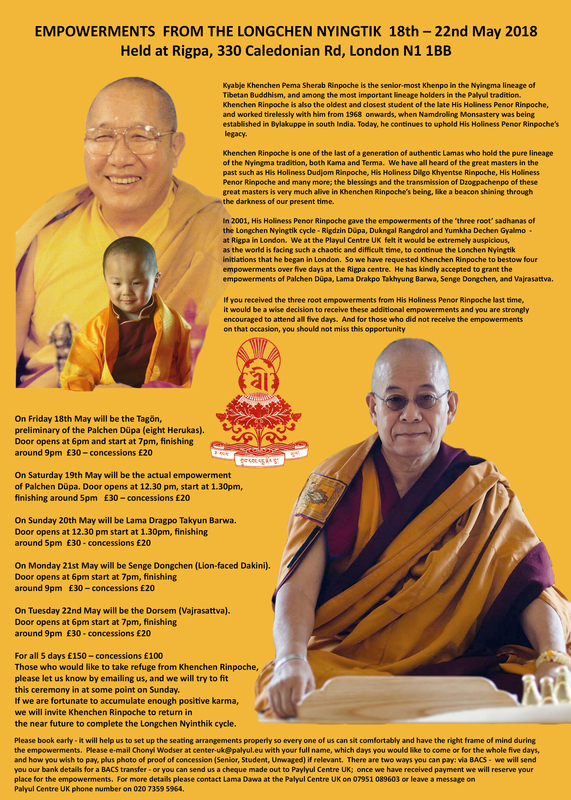 On Monday 17th September, Tuesday 18th September and Wednesday 19th September will be teachings based on the commentary by HH Dilgo Kyentse Rinpoche on the Seven Line Prayer of Guru Yoga by Mipham Rinpoche. Those who would like to take refuge from Khenchen Rinpoche, which will take place at 10.00 am on Sunday 16th September, please let us know by emailing us. Please book early – it will help us to set up the seating arrangements properly so every one of us can sit comfortably and have the right frame of mind during the empowerments. Please e-mail Chonyi Wodser at center-uk@palyul.eu with your full name, which days you would like to come or for the whole five days, and how you wish to pay, plus photo of proof of concession (Senior, Student, Unwaged) if relevant. There are two ways you can pay: via BACS – we will send you our bank details for a BACS transfer – or you can send us a cheque made out to Paylyul Centre UK; once we have received payment we will reserve your place for the empowerments. For more details please contact Lama Dawa at the Palyul Centre UK on 07951 089603 or leave a message on Palyul Centre UK phone number on 020 7359 5964. This event finished on 15 September 2018.